Institutional painting work is far different than what many painting companies are used to dealing with in a normal commercial setting. 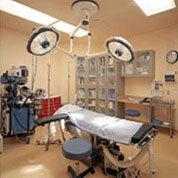 Institutional work almost always involves working in a sensitive environment such as hospitals, labs, and nursing homes. Our institutional clients will attest to our professionalism and quality of the work, as well as our crews ability to accomplish the work with a minimum of disruption to their important operations.